Thank you for considering purchasing a Premier Mantel. Our mission at Premier Mantels Inc., is to provide you with a high quality mantel, at a reasonable price, within a reasonable lead time. Our state-of the art 50,000 square ft. facilities are located in Florence, Alabama. Our first class facilities help us build a first class product. Our mantels are better than our competition's for several reasons. First we use state-of-the-art panel processing equipment and the best materials possible for all the large flat mantel parts. Since your mantel is being installed around a fireplace it is being subjected to sharp differences in temperature. 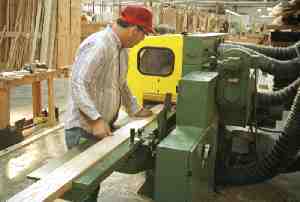 Temperature changes causes wood to expand and contract which can cause wide pieces of solid wood to warp, cup and split. Therefore, we use MDF (medium density fibercore) covered with a wood veneer rather than solid lumber for all our wide flat pieces. The MDF material should not be confused with particle board which is actually a low density material. MDF will not warp, split or cup and in this application we feel is a better material. We cover the MDF core with the best grade of veneer available. We use an a grade plain sliced veneer on all oak, pine and cherry mantels which gives you the look of solid material with the advantages of MDF. 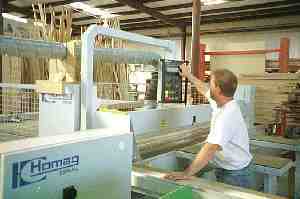 Each flat part is cut out on our automated panel saw that insures squareness of all parts and a perfect cut. Each part is put through our computer operated Machining Center that drills all assemble holes for our cam-lock system. This state-of the-art Machining Center is not the cheapest or fastest way to build mantels. But it assures that every mantel fits together perfectly and allows us the flexibility to build custom mantels quickly. All design changes are made automatically and accurately by it's computer. We manufacture all our own mouldings and plinth blocks in house. This insures proper tolerances and high quality and gives us the flexibility of building our products to order and custom sizes. We use the highest grade oak, poplar, pine and cherry available. Since we make our own mouldings and accessories, we can build mantels out of special woods, such as walnut and mahogany. 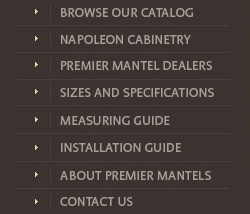 At Premier Mantels we want to be as flexible as possible while building a high quality product. At Premier we build each mantel one at a time. Each mantel builder is a skilled craftsman with many years of woodworking experience. Our employees take pride in the fact that their name is stamped on the back of each mantel they build. Each piece of moulding is meticulously cut and installed on the mantel. Whenever possible, parts are nailed together from the back side to eliminate as many nail holes as possible. Each builder is responsible for the completed mantel. Following assembly, each mantel is inspected and packaged by an experienced packager. Since each mantel is shipped either UPS or Common Carrier, it may be subjected to damage during handling. That's why we take great care in packaging our products. Heavy duty cartons, styrofoam and cardboard packing materials are used to package each mantel to ensure a safe delivery.